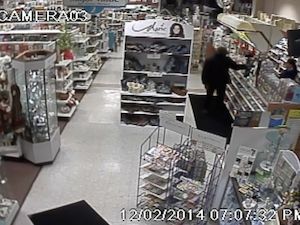 Armed robbery at Plains Pharmacy in Franklin on the evening of Dec. 2. Photo courtesy of the Franklin Borough Police Department. SUSSEX COUNTY, NJ – A crime spree has come to a close with the arrest of three individuals who terrorized both Morris and Sussex Counties over a three-day period. The Sussex County Prosecutor’s Office has announced the arrests this morning of Hardwick Stires, Robert Coloban, Jr, and Cassandra Post. Stires, 20, from Basking Ridge, NJ, has been charged in both Morris and Sussex Counties with three counts of both first-degree armed robbery and possession of an imitation firearm, has been charged additionally with third-degree theft (two counts) and one count each of terroristic threats (third-degree) and theft (fourth-degree). His accomplices Coloban, Jr. and Post were both charged with second-degree conspiracy (one count each). Coloban, Jr. is 19-years-old and from Far Hills, NJ and Post, age 18, is from Liberty Corner, NJ. Coloban, Jr. and Post are charged in the final robbery. The arrests were made through a joint effort between the New Jersey State Police, both the Franklin Borough and Kinnelon Police Departments, the Sussex County Prosecutor’s Office and with assistance from Somerset County law enforcement. The first armed robbery took place on Dec. 1 at approximately 5 p.m. at Roserne Liquors on Route 23 in Kinnelon. The suspect entered the store with a scarf around his face and brandishing a large silver revolver. He instructed the owner to place currency only and no coins into a bag, and was believed to have fled on foot towards Bed Bath & Beyond in the area. At the time, the suspect was described as a white male, six feet tall and approximately 180 to 200 pounds. The second robbery occurred at 10:42 p.m. the same day at the Delta Gas Station, Route 23 in Wantage. The same suspect sporting a scarf on his face appeared on foot, pointing a silver revolver and demanded cash from the attendant. As he entered, the suspect fled on foot. The third robbery occurred the following day, Dec. 2, at Plains Pharmacy, Route 23 in Franklin at approximately 7:20 p.m.. The suspect entered the store. once again with a scarf covering his face, with a metal handgun and motioned to the clerk at the register to fill a plastic bag behind the counter with currency without coin. Though the clerk did not see the suspect leave, the victim observed the suspect on foot near Staples. On Dec. 3, the final robbery occurred at about 11:23 p.m. at the Quick Chek, Route 206 in Hampton, with the suspect, as he had done in the previous robberies, requesting cash from a cashier inside, toting a gun and fleeing on foot. Stires’ bail hearing is scheduled for this afternoon, with bail set at $500,000 with no 10 percent option. Bail for both Colomban, Jr. and Post have not been currently disclosed. Editor’s Note: NJInsideScene.com will continue to provide information on this breaking news story. Stay on the scene with NJInsideScene.com and click here to follow us on Facebook.